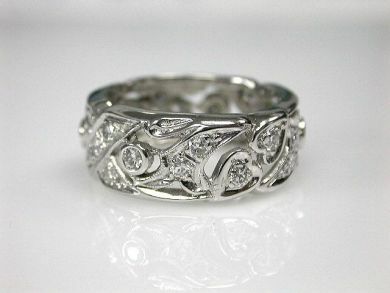 One 14 karat white gold openwork band. Four round brilliant cut diamonds (0.14 carast: VS-SI clarity: G-H colour). Twenty-one round brilliant and single cut diamonds (0.71 carats: VS-SI calrity: H-I colour). The ring has an "X and double heart" motif.